Ganesh Himal, not frequented by many tourists and situated in central Nepal, northwest of Kathmandu is characterized by the terraced hillsides that seem to climb to the sky. Many interesting ethnic groups and a mixed lifestyle offer you a glimpse into real Nepali life and this gives visitors an opportunity to observe the rich Nepalese cultural tradition from the closest quarter and intermingle with locals. Apart from this, the area also offers an excellent habitat for a wide variety of plants and animals: 526 species of plants (including 40 species of orchids), and 300 species of birds. Other interesting wild animals are the Himalayan Thar, Gaur, many kinds of Monkeys and Musk Deer. There are some interesting panoramic viewpoints, for example, the Singala pass, Pangsang Bhanjyang, Jaisal Kunda, Jyamrung. These places offer a view of more than 40 mountains over 6000m (19’680ft.). We start our trek from Betrawati, after driving almost 5 hours from Kathmandu. Going through picturesque villages and unspoiled areas of the country we arrive at Singalala where mountain views are superb. From here we descend through beautiful villages and finally get to Arughat where we catch our bus to Kathmandu. Trekkers carry only a daypack and walk at their own pace. Average hiking per day will be 6-7 hrs. Culture: Different Community with majority of Tamangs and their unspoilt culture..
Himalayan Sights: Ganesh Himal, Langtang, Manaslu and Himal Chuli and the large Annapurna Hima. Highlight: Close to Kathmandu, famous for unspoilt Tamang culture, spectacular views of mountains and colorful rhododendrom forest. 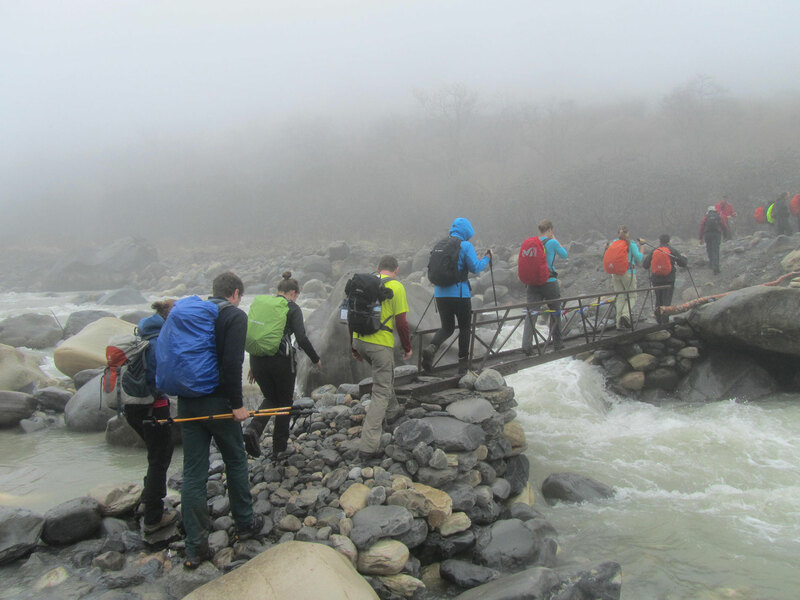 This trek is ideal for those wanting to escape from the more popular a crowed regions of Annapurna and Everest.